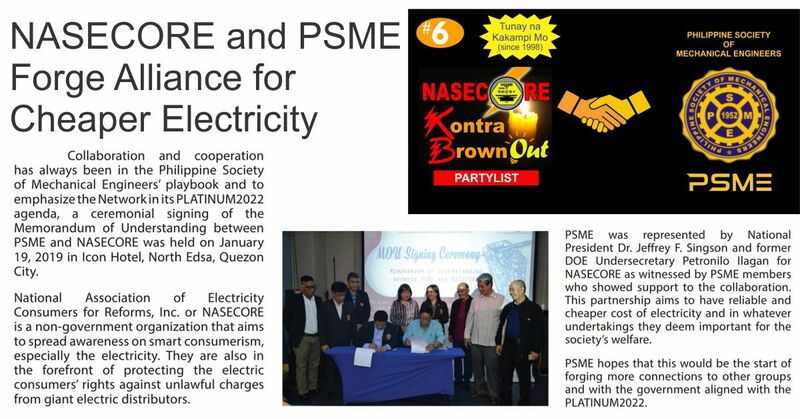 The PSME PLATINUM 2022 is set to be the goal of the society as it celebrates its 70 years of service to the members. PLATINUM 2022 is aligned to and is the continuity of the BESTGEAR Agenda. While the BESTGEAR brought dynamic changes in PSME in 2017 and 2018, the PLATINUM aims to have another huge leap in PSME in 2022. 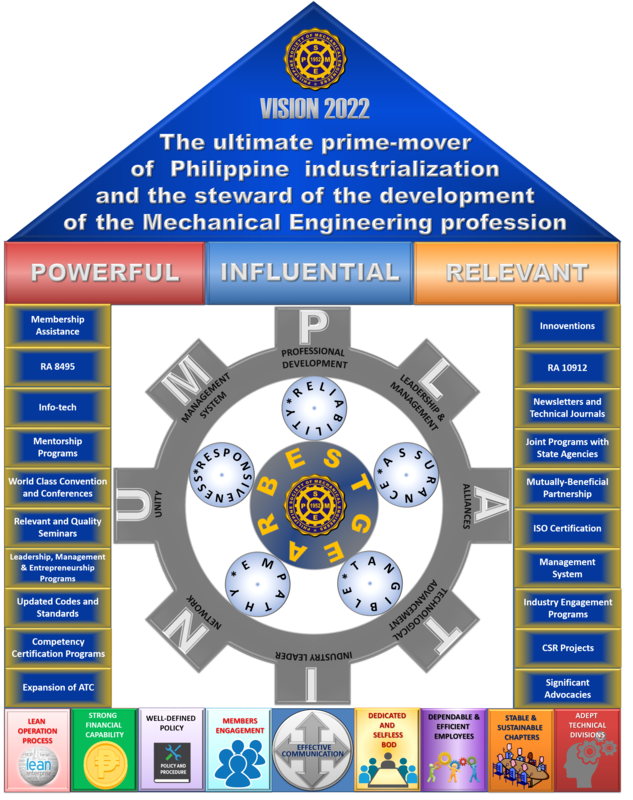 POWERFUL – PSME must have a great strength to be the driver of Philippine Industrialization. The strength that comes from a unified society equipped with knowledge and technical expertise needed by the industry. 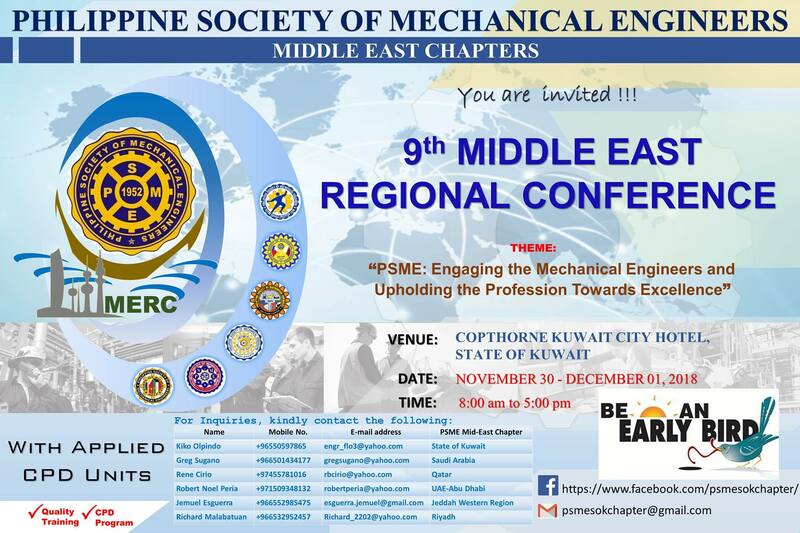 INFLUENTIAL – PSME must have a great influence to its members, the stakeholders, and to all our partners for us to be the guardian of the development of the ME Profession. 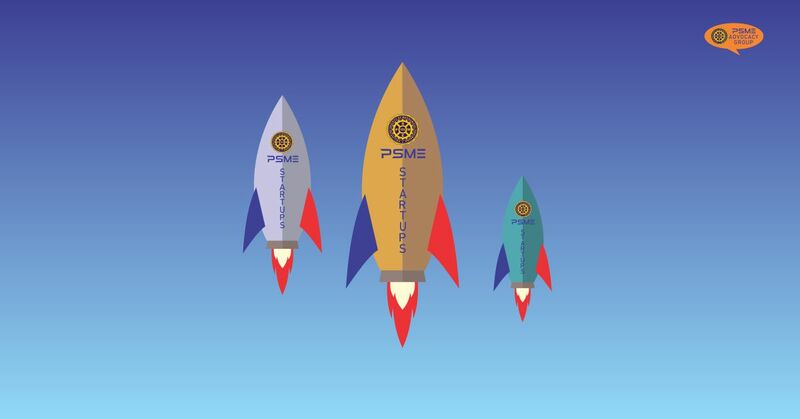 RELEVANT – PSME must be of great importance to its members, stakeholders, partners, and the state. They will see PSME as a relevant organization when we can provide solutions to their needs. We would like to inform all of you that we have reached an agreement with the Campa group with regards to the PSME Unification. As a result, we have TOTAL UNIFICATION now in PSME. 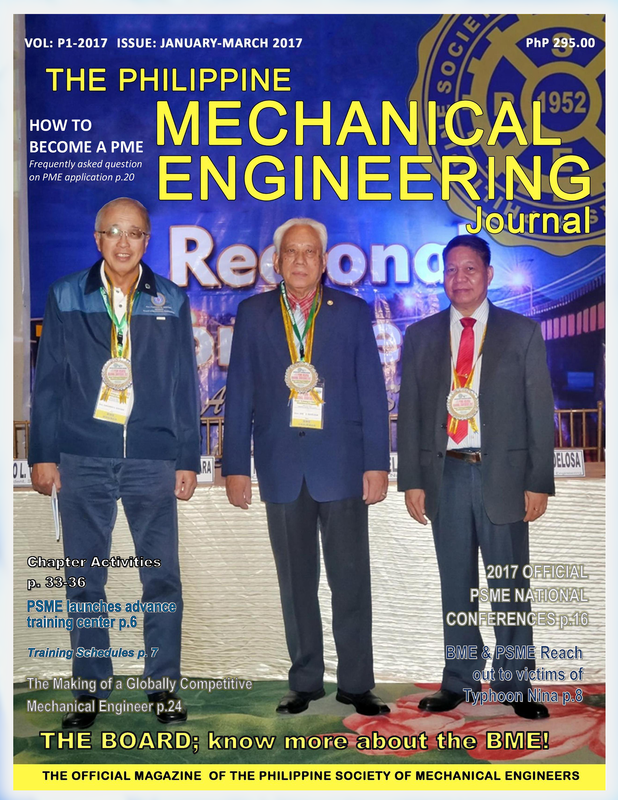 Finally, we have achieved ONE PSME. 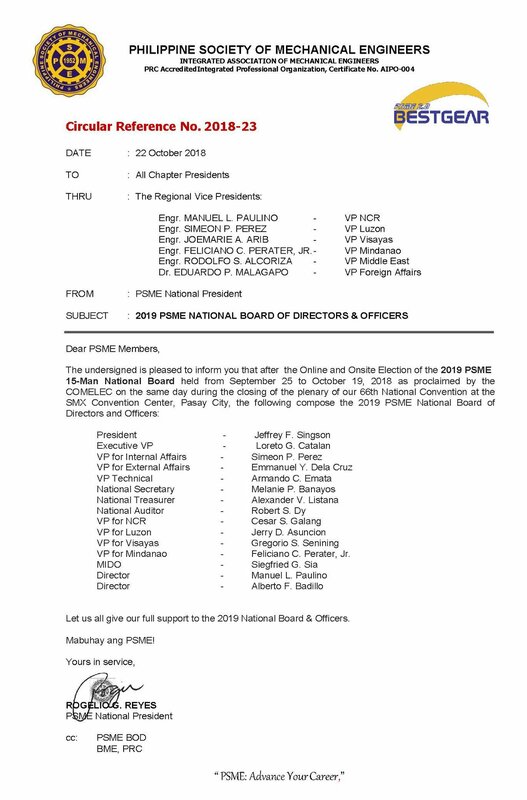 In the agreement, the 2019 National President will be Paredes’s Dr. Jeffrey Singson, and to his credit, Engr. Jeremy Aguinea volunteered to be the EVP. Along with this, an agreement was approved to generate an interim board that is composed of 9 officers from our group and 6 officers from the Campa group. Yes, many made sacrifices to make this happen. This particular agreement had a lot of support from the DOLE’s Secretary Silvestre Bello, DOLE Undersecretary Jacinto Paras and PRC’s Chairman Teofilo Pilando. We have agreed on terms that we believe, can deliver lasting peace, our prime consideration. Or else, the damages done to our organization and the sufferings experienced by the chapters and members for the last 3 years are for nothing. The process and the work to strengthen and maintain this unity will undoubtedly be more difficult. And all of us needs to continually work to achieve peace and harmony in our Society, even down to the chapter level. 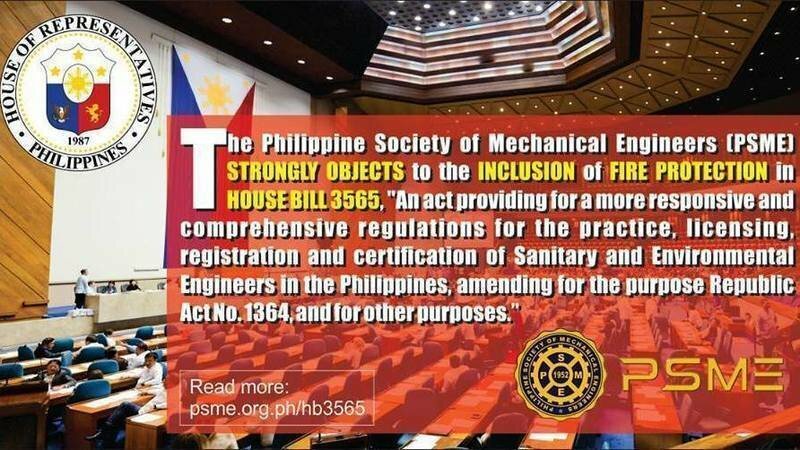 The Philippine Society of Mechanical Engineers (PSME) strongly objects to the inclusion of Fire Protection in House of Representative Bill 3565. Click to join the campaign against it. 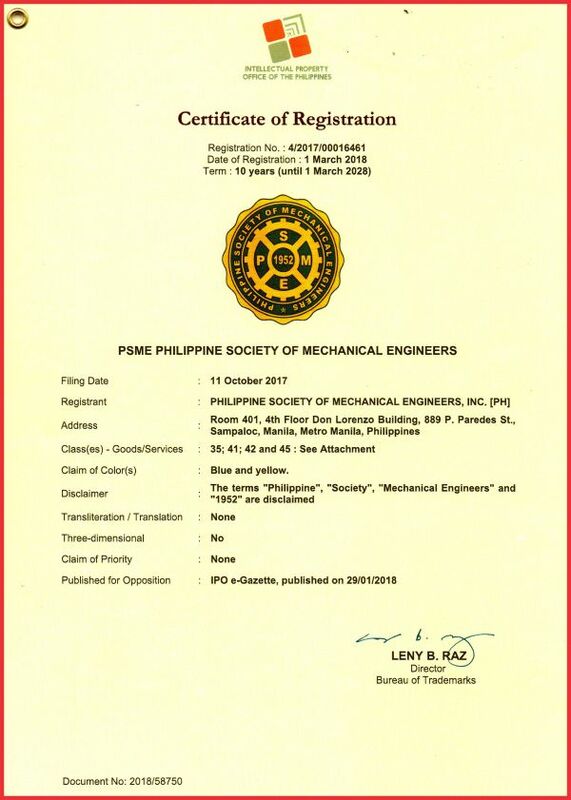 The Philippine Society of Mechanical Engineers (PSME) and Philippine Domestic Construction Board (PDCB) signed a Memorandum of Agreement on January 23, 2018 at the Construction Manpower Development Foundation Conference Room, Executive Building Center, Makati City. 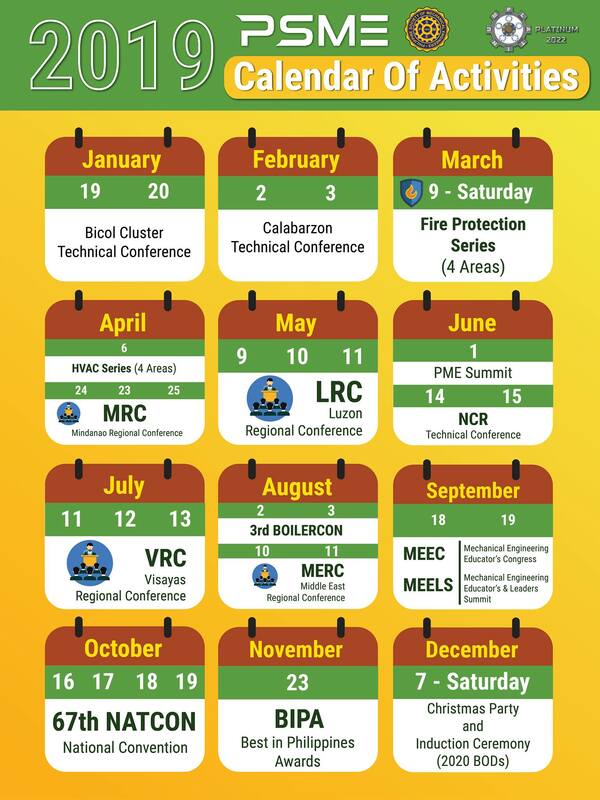 The MOA aims to establish a partnership for the implementation of Constructors’ Performance Evaluation System (CPES) starting off with Seminar Workshops for the accreditation of PSME officers and members as CPES evaluators, as well as the endorsement to PDCB of those who are willing to be trained as resource persons for CPES seminars. The MOA was signed by PSME National President Rogelio G. Reyes and PDCB Executive Director Doris Gacho. 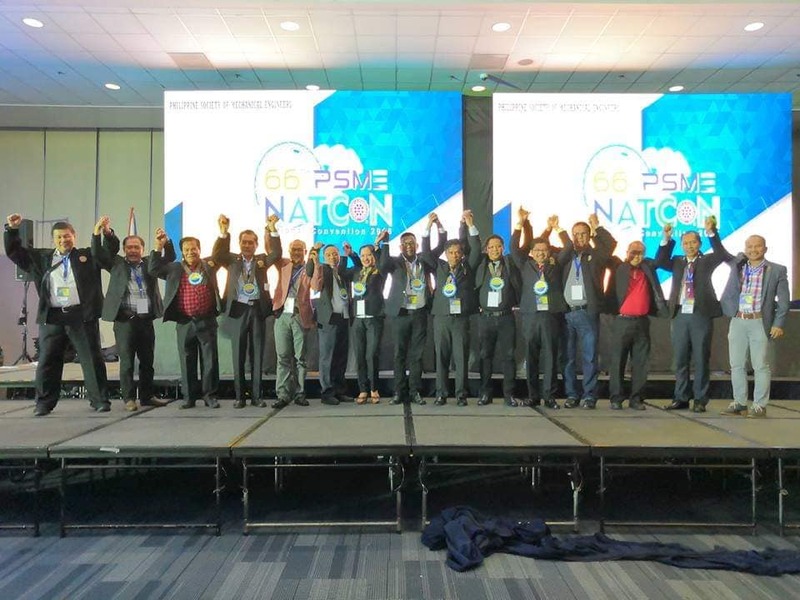 PSME National VP for Luzon Simeon V. Perez, PSME National Secretary Loreto G. Catalan, Construction Industry Authority of the Philippines (CIAP) Executive Director Ramon L. Abiera, and PDCB Chief Trade and Industry Development Specialist Leilani D. Del Prado signed as witnesses. 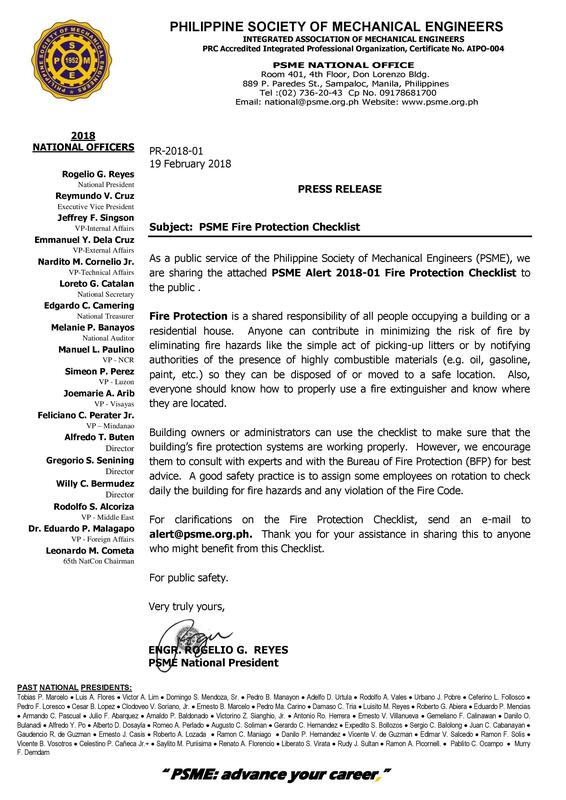 Among other roles in the said partnership, PSME shall serve as a coordinating body in the implementation of CPES program and provide a link to the PDCB in matters relating to CPES. 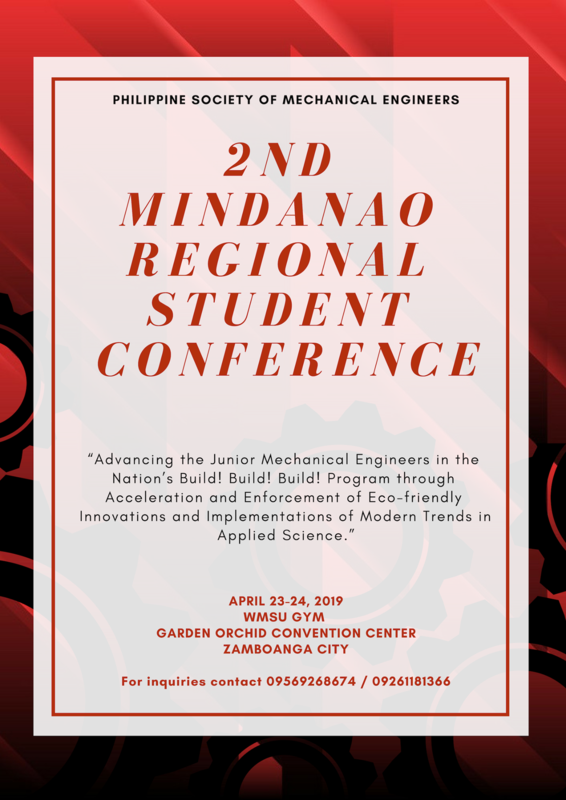 VP Technical - Nardito M. Cornelio, Jr.
VP for Mindanao - Feliciano C. Perater, Jr. 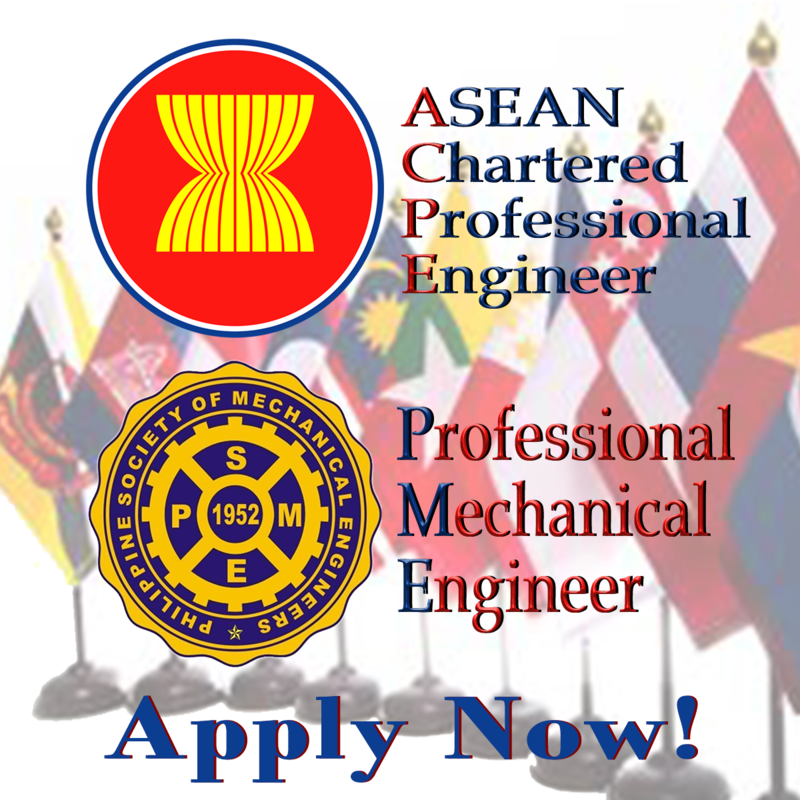 Become an ACPE, APEC or Asean Engineer. 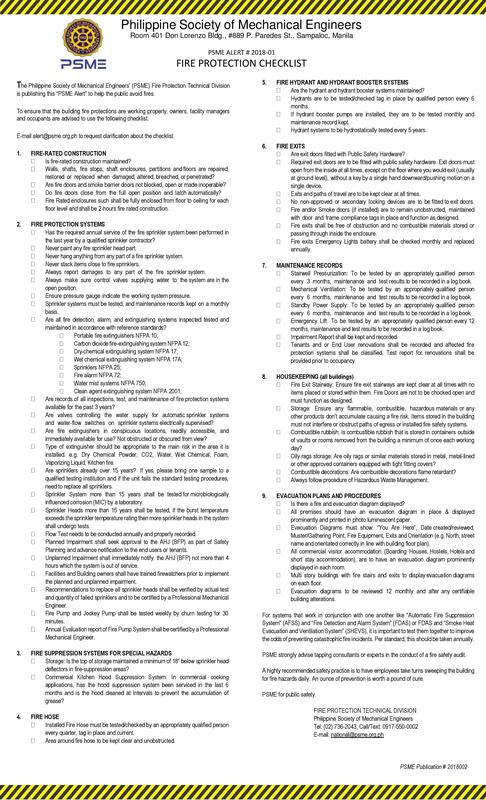 Click here to download the forms. Find you dream job at PSME Job Center. We want to know your opinion. 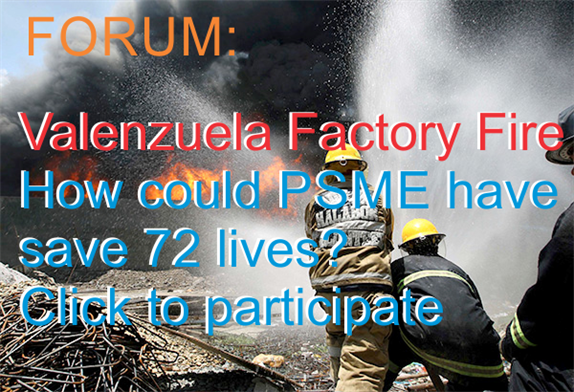 Join in any of our PSME Online Forums. 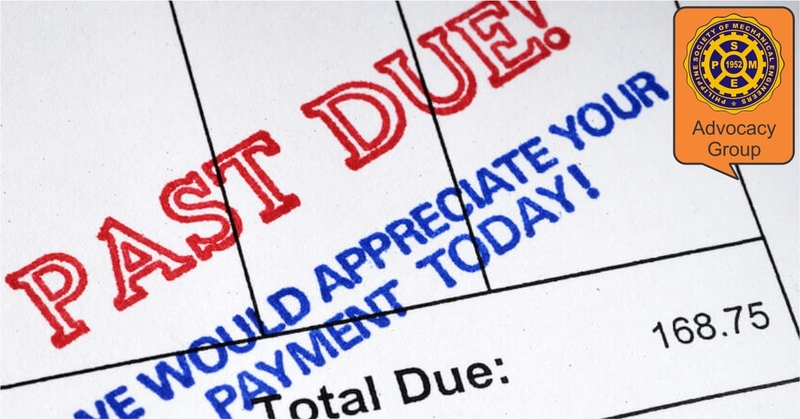 Participate in the Late Payment Survey. Click here. 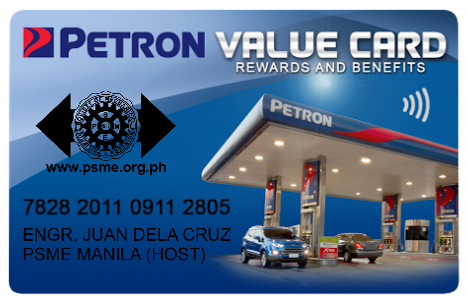 Get your personalized PSME-Petron Value Card Now for P100 only! 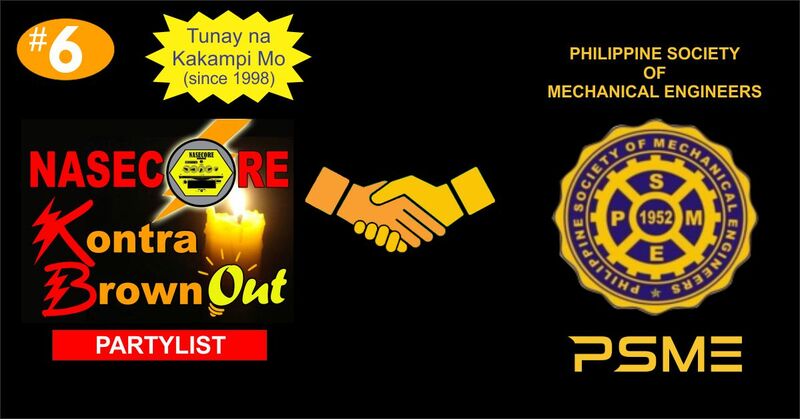 P6.00 reward per P500 purchase of Petron products and discounts in various establishments all over the Philippines, Free Towing Service and P10,000.00 Insurance. 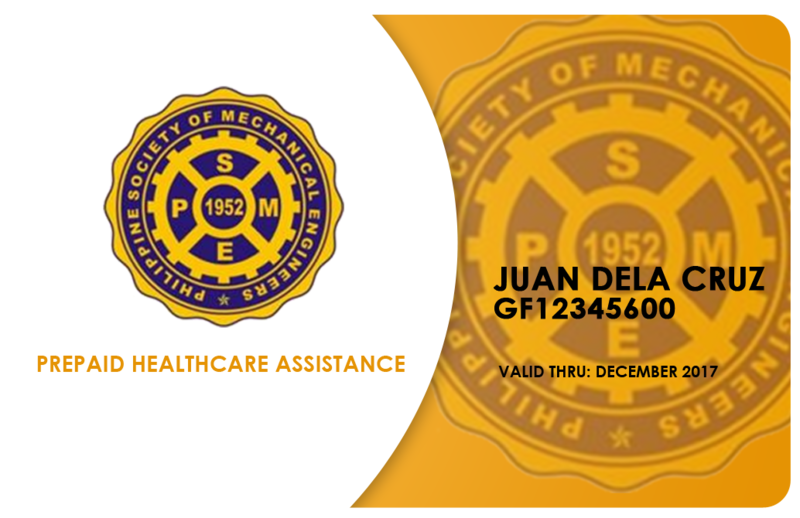 Email membership@psme.org.ph your order or contact your respective chapters.